Given how fun Mission: Impossible – Rogue Nation often is, it’s hard to blame Paramount for squeezing every drop of momentum out of the series while it can. With four installments spanning two decades, the best that could be said about the Mission: Impossible franchise up until now is that it never repeated itself. Like one of those reality competitions where chefs concoct separate dishes using the same ingredients, four different directors have given four different takes on an action movie recipe that uses gadgets, double-crosses, and Tom Cruise as its base. What the series lacked for movie-to-movie consistency it gained in personality. It’s a balance that Mission: Impossible – Rogue Nation, the fifth entry, ends up inverting, while still delivering another espionage-fuelled adventure in a year full of them. Rogue Nation is the first Mission: Impossible to look, feel, and play like a proper sequel to its previous entry –not a bad deal, considering what a thrill 2011’s Ghost Protocol was. Stepping in for Brad Bird is Jack Reacher director Christopher McQuarrie, who also wrote the screenplay for Rogue Nation. As a frequent collaborator with star Tom Cruise, Rogue Nation represents an apotheosis of sorts for not just McQuarrie, but the blockbuster relevance he’s helped the 53-year-old Cruise enjoy of late. Rogue Nation reaches this climax in its first five minutes. Unless you’ve been living in deep cover with an Amish community for the last year, you’ll have heard about the movie’s most impressive stunt, in which Cruise, not a double, hangs off the side of an airborne airbus. If Cruise’s hope was to outdo his scaling of the Burj Khalifa, his previous high-water mark for self-endangerment while playing superspy Ethan Hunt, then Mission Accomplished. That a scene so heavily advertised as Rogue Nation’s main course turns out to be just an aperitif is the biggest, most welcome surprise the movie has in store. The worst, then, that can be said of Rogue Nation is that it’s unlikely to be anyone’s favourite Mission: Impossible. Rather than devolving into a bombastic bore like the overcooked Mission: Impossible II, Rogue Nation so closely follows the gait set by Bird’s outing that further crimes against punctuation are the only thing keeping the title from being Mission: Impossible – Ghost Protocol (Part II). What you wind up with is the first M:I movie that’s missing a new identity. Good thing the one it’s adopted is almost as entertaining as ever. Picking up on a story thread teased at the end of the last movie, Rogue Nation opens with the U.S. government doing what no terrorist organization ever could: dismantling the Impossible Mission Force. The era of oversight puts Hunt and his crew (returning: Simon Pegg, Jeremy Renner, Ving Rhames. Absent: Paula Patton) out of a job, and just as they were closing in on a nefarious terror cell called The Syndicate. If the government had been paying attention, they’d know that Hunt and company do their best (only?) work once disavowed. The staples of Mission: Impossible are all here, with ridiculous gadgets (two words: Flute. Rifle.) and actions scenes delivered at a steady clip. As is so often the case, a Rolodex of undercover operatives is in danger of falling into the wrong hands. In a twist, it’s The Syndicate’s data that’s up for grabs; in keeping with expectations, the main villain (Sean Harris) is mostly an afterthought. What’s new this time around outdates even the original Mission: Impossible TV series. “The I.M.F. is a throwback to an era without transparency,” Alec Baldwin’s C.I.A. suit, Hunley, says early on. McQuarrie is pitching all the way back to ‘40s noir with Rogue Nation. Battling Imperator Furiosa for “Name of the Year” honors is Ilsa Faust (Rebecca Ferguson), a Syndicate assassin whose loyalty gets shuffled and flipped like three-card Monte. No stock femme fatale, McQuarrie and Ferguson make Ilsa a dynamic foe, partner, and foil for Hunt. Ferguson and Cruise have dynamite interplay, though the chemistry is complicated by Rogue Nation’s awkward non-acknowledgement of Hunt’s wife from the previous two movies. 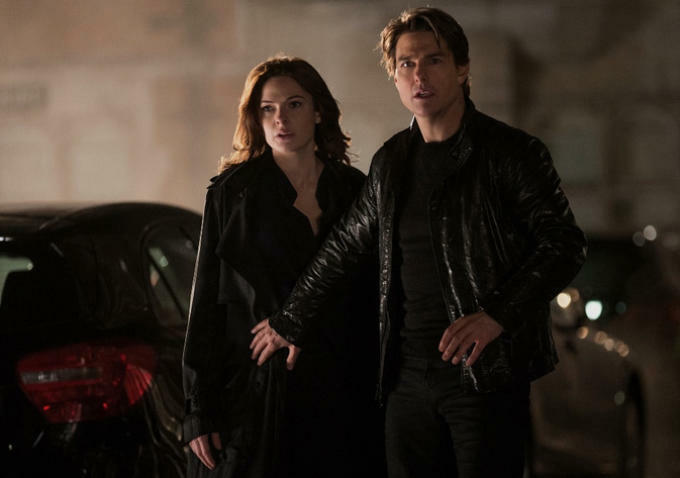 The slightly winking tone established by Ghost Protocol still allows Mission: Impossible to charm its way through flimsy plot logic, and McQuarrie knows better than most about when and what to undercut for a joke. But the franchise’s selective memory and rotating cast are catching up with it, as attempted character beats between setpieces usually ring hollow. Hunley later refers to Hunt as “the manifestation of destiny,” an apt description for a character and series all about action, not individuals. That action is the real draw, however, and it’s some of the year’s best. The aforementioned plane sequence is an achievement in clean, jaw-dropping spectacle; a follow-up opera house assassination, which intricately cuts together four different points of action, proves to be its antithesis and equal. Befitting of a property immortalized by its main theme, Rogue Nation is also a great sounding action movie. A pack of motorcycles roar through a desert highway chase, and the muffled noise of an underwater computer hack contributes as much to the tension as Robert Elswit’s crystal clear cinematography. Because Rogue Nation assigns so many of its biggest moments to the first hour, a comparatively tame second half will lead some to suspect that the franchise has finally petered out. The finale, which is aces as part of the spy noir McQuarrie smuggles into a blockbuster framework, can’t come close to topping the best of Mission: Impossible in its current incarnation. Rogue Nation is the first entry where Cruise’s age makes you wonder (but never doubt) if he’s still up to the task, so a pause for reassessment before M:I6 seems unlikely. Mission: Impossible – Rogue Nation keeps the brand in fine shape, but also starts the countdown timer to when it will have to reinvent itself, or self-destruct.